Hi! I'm an ordinary Kiwi mum who needs to feed her family well while spending less, wants to learn new skills, and inspire others along the way. 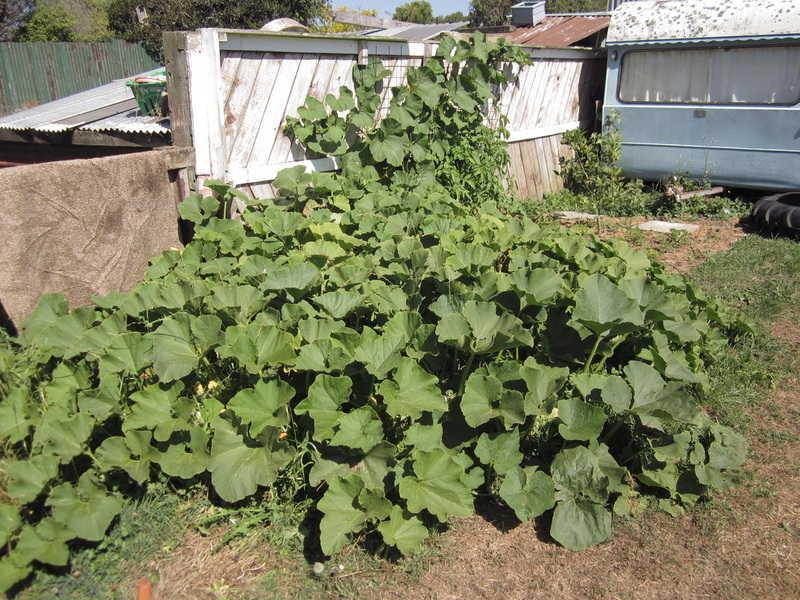 Starting basically from scratch, I decided to set a goal to grow 1000 kgs of food in my back yard in 2013. To read all about how I got to this point, see the About Us page. To see photos and read about how my garden is growing, as well as find info on growing food, saving money, preserving, making your own cleaners and other DIY, and more, read my blog. I'm just getting started here, so be sure to check back often for new content. If you're on Facebook, you can like the Kiwi Urban Homestead page so you won't miss any new posts. .....growing a ton of food in their back yard. Yes, an actual ton! When I decided at the end of 2012 to set the goal to grow 1000 kgs of food this year, I was starting with 4 small raised beds (2m x 1m), and one 3.25 x 1.25m bed, all of which were overgrown. I started by weeding those and planting some new seedlings. I determined I would plant whatever I could, wherever I could. I'm by no means an expert gardener, but I'm ready to give things a go and learn along the way. I decided from the start to keep a garden diary to record what was going on each day and month, and to take photos of the garden at the beginning of each month so I could see the changes. You can see my monthly photos on the Blog, along with monthly totals of how much has been harvested. Do you grow food in your garden? Would you like to? Wondering how to get started, or looking for more inspiration to keep you going? Want to know how to preserve food, cut costs, or feed your family well? Do you have your own ideas you'd like to share? Questions? You've come to the right place! Read my blog and post questions or comments. You can also drop me a line through the Contact page. If you'd like to share some of your own gardening adventures or other homesteading experiences, I'd love to hear from you. If you would like to share your homesteading successes here too, with photos and your own story, I'm interested in hearing from you - together we can encourage and inspire others. Homesteading is really just living closer to the way our forebears did - by learning the old skills we can do so much more for ourselves! Homesteading involves doing things at home to sustain and nurture your family. It involves a broad range of skills, and different folk chose to engage in various ones. Homesteading might involve growing food in the garden, raising chickens for eggs and/or meat, keeping livestock (sheep, cattle, goats, rabbits etc) depending on available space, cooking, preserving, sewing, knitting, weaving, spinning and other crafts of all kinds. Perhaps it might involve soap making, making home-made cleaners and beauty products, seed saving, cutting your own firewood or a myriad other things. The way most modern Westerners live is not normal. Everything about our lifestyle today is new - it has only been around for a short period of time. And most of it is entirely dependant on cheap fuel. Our stores carry only enough product for a couple of days - they rely on "just in time shipping" to bring more every day or every couple of days. We live lives full of hurry and rush, buy food from the supermarket, don't know our neighbours, drive all over the place, waste hours watching TV or playing computer games, dash from one meeting to activity to another. We're often worn out, frazzled, and unhealthy. Our bodies were never designed for this kind of lifestyle. It comes at a cost - to our health, our finances, our families, and our peace. And it's not sustainable - not for us, not for the planet. Homesteading is about slowing down a little, learning some of the old ways. Learning to feed ourselves real food - food that nourishes and heals. Getting to know some of our neighbours. Developing skills, spending time with our families, sharing our excess with others. Homesteading definitely involves some hard work! But it's good work, and a more peaceful way. Homesteading also gives us the gift of being less reliant on "them" and more self-reliant. With homesteading skills, if disaster strikes, whether in the form or a natural disaster, economic collapse, job loss or illness, or whatever, you will be more prepared and able to cope. You will know what to do to care for your family, and you will have the things you need on hand. "Prepping" is a popular phenomenon these days. We should definitely all be more prepared for the unexpected. Most of what modern preppers are talking about, though, is really what was just normal living in the old days - keeping ample supplies on hand, putting up food, growing your own, being ready to care for your own without outside help. These are all skills that can be learned. Many folk think that in order to homestead, you need a nice big piece of land out in the country, and if they can't afford that, they throw up their hands and say they can't do anything. But we ALL can homestead, even if all we have is a square-handkerchief size yard. Sure, where space is limited, you have to be more creative, and some things won't be possible. But we can all do something, and we can all learn new skills. If you don't have room to grow your own wheat, you can learn more about wheat, and where to buy it organically, how to grind your own and make your own bread. If you don't have enough room to grow all the tomatoes your family needs for a year, you can learn to bargain, and get to know your local growers and buy in a years supplies when they are at their cheapest, and learn to preserve them. You might not be able to keep sheep, but you could learn how to bring home a side of mutton from the butcher and cut it up yourself, saving a lot of money. Do you get the idea? Wherever you are, whatever you have, you can focus on what you do have and can do. We can all learn new things. We can all learn old skills. We can all homestead and provide for our own and save a lot of money plus be healthier and happier. My family and I have lived on large properties in the past, and just being on much land doesn't automatically make it easier! Yes, it broadens your choices, but it can also cost more money to get things started, and if you don't have or acquire the skills first, then it can be quite overwhelming. That is why I encourage you to start where you are. And it's why we are doing what we are doing, right here on our section in the middle of town. I want to show you that you don't have to own a farm to grow your own food. I remember when I was a very small child, my great-grandmother's house has stores of home-bottled fruit on shelves in the basement. But I never learned this skill growing up. Years later, when I was pregnant with my 4th child, we lived in the country and a friend there did masses of preserving every year. I begged her to teach me, which she did, and once I knew the basic process, I was able to branch out on my own and do more and more. You can do this too. Learn the basics of one skill, then keep on using it and you'll learn to apply it in new ways.